I received 2 amazing bottles from the Enchanted Flame Etsy Shop. 1 for me, and 1 to give to one of you. For me, I chose the "Skittles" bottle. 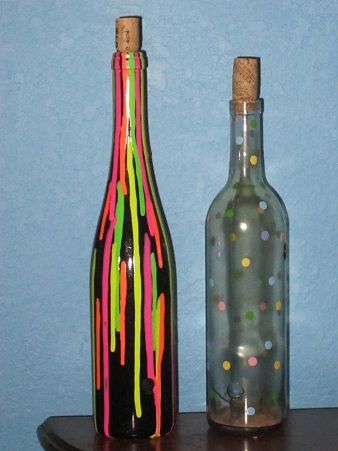 It's really awesome!The "Skittles" bottle actually comes in a few different colors, and patterns. For instance, the one I received has more pastel colors, and less dots, and the ones she has available in her shop, have darker colors and more dots. Each glass bottle has holes drilled into it. You light incense, and place them inside the bottle, and the smoke flows out of the holes. The room is soon filled with a lovely smell! That's not the only thing about these incense bottles that I love. There's actually a lot that I love about them! First off, all of the Enchanted Flame bottles are recycled. If not used for this, they would have simply been thrown out, and put in with the worlds ever growing trash-heap. I also love that these are hand painted! Each bottle is a unique piece of art, and there aren't 2 anywhere, that are the exact same! Each piece is OOAK (One of a Kind.) These incense bottles are much cooler then the boring incense stick holders. I love them! What I love most about the one I chose is that it is see-through. When the bottle fills up with smoke, you can see it all swirling around, and it just looks really cool! I love plugging up the holes, and then watching the smoke just pour out. These bottles are truly amazing They make great gifts for any occasion, and I highly recommend them. Sophie (the owner) will also work with you to make custom designs! So if there's something your interested in, and don't see it, be sure to send her an email inquiring! Sophie sent me an extra bottle. The "Blacklight Rain" bottle to give to one of you! Mandatory Entry: Visit the Enchanted Flame Etsy Shop, and tell me your favorite bottle design. ﻿﻿Disclosure: Review product is bring provided to me free of charge to ensure an honest review. All opinions expressed are my own, and were not influenced in any way. Facebook is not involved in any way. Only 1 entry PER HOUSEHOLD. Be sure to leave your email address in each comment.This giveaway will end June 29th, 2011 at 11:59pm. All of the bottles are pretty! I love incense and i think a pack of incense and one of these bottles would be the perfect gift to turn any incense newbie into a fan. The Black Light Bottles are Groovy! My other favorite is the Splash of Red Bottle. I like the aqua falling leaves. I shared on facebook (and tagged you). I entered the big G gieaway. I entered the Scare me not giveaway. I entered the HydroSaucer giveaway. Hey Amanda , hiiiii babe, how have u been! These bottles sure are pretty! Am very sorry to hear about ur Grandpa, all i can do is, in my heart pray for u and all at home to go thru this time! Take care and lods of love and hugs to ya ! Going to have to go with Sky Splash as my fave. Such great pieces though. I love Skittles too. It would be a great gift. Added the shop to my faves on Etsy. And added Sky Splash to my faves. And am a fan of your page as well. My favorites are Sunflower Sunshine and Go Irish because they remind me of my grandfather. He was always proud of the Irish in him (a little, not sure how much) and always named a sunflower "June" after me because I did not like them. Since he died, I love them because they remind me of him, just like anything Irish does. follow on GFC as June M.
The Blacklight Sponge is one of my favorites. I "Heart" the blacklight sponge in the Enchanted Flame Etsy shop. Heart my favorite item in the Enchanted Flame Etsy shop~! Added you as a Friend on Facebook Sent request. Buttons are like friends,,,,, a girl can never have to many~! My favorite bottle design is Aqua Falling Leaves. I hearted my favorite item - the Aqua Falling Leaves bottle. My favorite design is the sunflower. So pretty! I like Skittles...cute stuff, thanks. katklaw777 "Hearted" the Enchanted Flame Etsy shop. I hearted the Enchanted Flame Etsy shop under the username likwan. I hearted my favorite item in the Enchanted Flame Etsy shop under the username likwan.